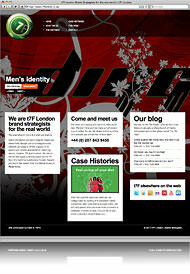 t7F London had seen the work we were involved in developing and keeping up to date the interestment.co.uk website. They required a website, with blog built-in, to showcase their work and have a place where they communicate with the world through their blog. The site is very creative minded and features a full screen homepage scroller that incorporate their main case studies. Although the blog is a part of the main site they wanted this to look different but still with keeping with the feel of the site. Take a look at the site now.